During a time when looking to the future is more important than ever, author Terry Savage offers street smart advice for the many soon-to-be retirees wondering how much longer they will have to work to make up for the losses in their retirement accounts. 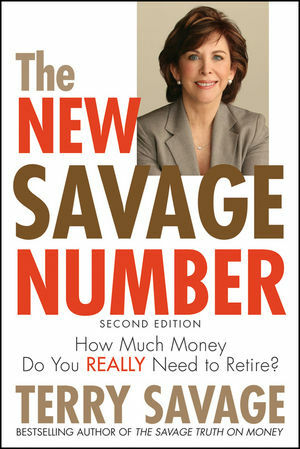 The New Savage Number provides the strategic guidance and hands-on techniques necessary to plan a successful, satisfying retirement. Written with every retirement bound individual in mind, The New Savage Number, Second Edition provides you with the tools needed to rescue your retirement. Terry Savage has financial expertise that comes from experience. She started her career as a stockbroker and became a founding member ofand the first woman trader onthe Chicago Board Options Exchange. Terry is a nationally known expert on personal finance and is a regular TV investment and financial markets commentator. She is the nationally syndicated Chicago Sun-Times personal finance columnist and author of three bestselling books. Terry has won numerous awards, including the National Press Club Award, and received two Emmys for her television work. How to Avoid Wasting Time (and Money). 3 The 10 Key Questions. What Will Inflation Do to the Value of My Savings? How Can I Save Enough? How Should I Invest the Money I've Saved for Retirement? How Much Will I Spend to Live in Retirement? How Much Can I Withdraw Each Month without Running Out of Money? What's the Biggest Danger to My Retirement Plans? How Can I Earn Money during Retirement? How Can I Retain Control of My Financial Life? What If I Have Money Left Over When I Die? Part 2 Monte Carlo Your Money. 4 The Savage Answer: Monte Carlo Modeling. Monte Carlo Modeling—How It Works. Monte Carlo Modeling and Retirement Planning. Monte Carlo and You . 5 Saving Up, Drawing Down. Seven Best Ways to Save for Retirement. 6 Getting It All Together. Online, On Paper, On Your Computer. The Basics: Paying Bills Online. Organizing Your Online Financial Life. Resources for Getting It Together. 7 A Road Map to Monte Carlo. Part 3 Investing for Retirement. 8 Stocks, Bonds, and Chicken Money. Keep Your Nest Eggs Safe with Chicken Money. A Minute on Mutual Funds. Resources for Stocks, Bonds, and Chicken Money. Retirement Investing Made Easy: Targeted Retirement Funds. Part 4 Streams of Retirement Income. 11 Where Will the Money Come From? The Balancing Act: Income versus Principal. Generating Income from Your Portfolio. 12 Annuities for Income and Tax-Deferred Growth. Your IRA Inside an Annuity? Annuities: The Real Risk Factor. Annuity Information and Pricing/Insurance Company Safety Ratings. 13 Social Security and Medicare. A Final Thought about Social Security and Medicare. 14 How to Turn Your Home into Your Pension. More Income from Your House Using Trusts. Part 5 Long-Term Care: The Greatest Risk of All. 15 Long-Term Care Insurance: Who Needs It? The Government’s Role in Long-Term Care. Long-Term Care Insurance: A Woman’s Issue. What If You Don’t Use It? 16 How to Understand Long-Term Care Coverage. When to Buy? While You Can! What Should My Long-Term Care Policy Cover? Key Elements of a Long-Term Care Insurance Policy. 17 Buying Your Long-Term Care Policy. Which Insurance Company Should You Choose? Long-Term Care Policies and Income Taxes. Paying for Long-Term Care with Life Insurance and Annuities. Employee Group Long-Term Care Policies. The Federal Long-Term Care Insurance Program. Long-Term Care Insurance from Affinity Programs. A Final Argument: The Cost of Not Having. Resources for Purchasing Long-Term Care Insurance. Moving Assets Out of Your Estate. Life Insurance and Your Estate.